Sexual Harassments patrols .. are u with or against? Today, simple ordinary people have organized them selves, wore a uniform, spread through the streets of downtown trying to prevent teenagers and perverts from sexually harassing girls on the streets. sexual harassment is becoming a major problem in egypt .. the latest recorded incident was the one occurred to the 24 France female correspondent who was harassed while broadcasting life from Tahrir Square.. a journalist told the story of this on the Time magazine two days ago (the vicious circles of the square). I know that sexual harassment is wrong .. but this is worse .. encouraging people to take matters into their hands is the fastest way into tearing any society apart. if they now interfere to prevent sexual harassment, tomorrow what will prevent them from chasing couples on the streets asking if they were married or not, what will prevent them from forcibly closing liquor stores, hotels or pubs under the claim of protecting the society from all evil. it's now a group of liberals who decided to force their moral code on the streets, but this will encourage the Islamists to do the same as well .. and of course this will weaken our police forces even more. if these are not militias then what are they called !? i fear that this might lead to a worse descent in our already fallen state. I think that sexual harassment has to be addressed in a different way other than this .. what do u think? 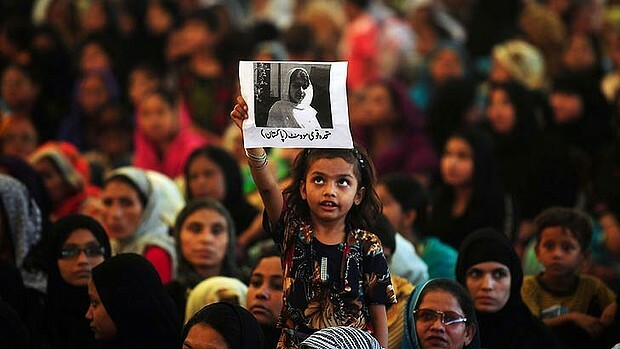 A child holds aloft a photo of Malala Yousafzai during a protest in Karachi over her shooting by the Taliban. THE targeting of Malala Yousafzai, the 15-year-old girl shot this month by a Pakistani Taliban assassin, brought back memories of my teenage years in Tehran, where theocratic zealots were similarly in control. The words of the Taliban's chief spokesman, Ehsanullah Ehsan, had a chillingly familiar echo in my ears. A bullet had Malala's name on it, he explained to the news media, because ''she has become a symbol of Western culture in the area; she was openly propagating it''. He also called her ''the symbol of the infidels and obscenity''. Iran's war with Saddam Hussein's Iraq was then in its second year; it was begun by the ambitious Iraqi dictator, who harboured expansionist dreams. But in the course of daily life in Iran, where harassment of women was reaching a fever pitch, the war was not over land or resources, but the honour of the nation's women. The war with Iraq was not even the one the country was told to gird itself against. The bigger, bloodier but ultimately triumphant jihad was yet to come, Ayatollah Khomeini reminded us. It would be against ''world-devouring'' US imperialism and its proxies, the ''blood-sucking Zionists''; they were at the root of all the world's evil. That all-out war, forever looming, has never come. But the war on women has been raging ever since. At the school gates every morning, we were greeted by our own Taliban, members of the the morality unit, in charge of ''preventing vice and promoting virtue''. They rubbed the face of my rosy-cheeked classmate to the point of bleeding to make sure she was not wearing rouge and pulled at the long eyelashes of another to see if they were real. We missed months of math that year because schools were newly segregated by gender and there were not enough trained female instructors in the country to teach in the girls-only classrooms. Two months before the end of the year, a few of us signed up for private lessons given by a man who stared at the ceiling while teaching, lest he violate segregation laws by looking at us. The burning effigies of Uncle Sam, and the inflammatory rhetoric against modernity and the West, had done their work. The world cringed and turned away from Iran. Just then, the age of marriage was lowered to nine; the weight of a woman's testimony in a criminal trial was halved against a man's; divorce, abortion, inheritance and custody rights were slashed; several academic careers were banned to women; and the Islamic dress code was reinstituted. Public spaces in Tehran, including buses, were segregated by gender, and the faithful's fists pumped into the air, punctuating Friday prayers with ''death to America'' chants. Credit for the discovery of this wicked double helix - the pairing of dramatic acts of anti-Americanism with an insidious assault on women, which subsequently infiltrated the DNA of fundamentalists throughout the region - goes to Ayatollah Khomeini. Early in his long career, he gave speech after speech about the ''toxic'' influence of the Pahlavi monarchy on the nation's family values - the ayatollah's euphemism for the growing freedoms of women under the shah. But Khomeini's anti-feminist diatribe did not catch the public's imagination. What catapulted him to national stature began with his fiery criticism of a 1964 decree that gave diplomatic immunity to non-diplomatic US personnel working in Iran. By 1978, when his journeys through exile landed him in France, he no longer sounded like his misogynist self of a decade earlier. Now Khomeini cast himself as a nationalist in the image of Mahatma Gandhi, fighting the foreign powers that were plundering his motherland. His anti-Americanism lifted him to nationwide leadership, and he set to work on his earlier agenda. Days after his arrival in Tehran in February 1979, he issued an order to abolish women's freedom in dress and to bring back the mandatory hijab. Two factors have since veiled the Western perspective on the region: the first is the expression of anti-Americanism, which sends the rejected American psyche into a downward spiral of introspection over feckless US policies and leads to inaction. The second is the use of Islam as a wall of privacy, behind which oppressors act with impunity. Both factors function as a disguise. Behind them, where women are concerned, all the seemingly unbridgeable divides merge seamlessly to connect Sunni Saudi Arabia to Shiite Iran. Thus far, the Arab Spring has brought a severe frost to women's rights. In Libya, women are grossly under-represented in the new government. In Egypt, the image of a female protester, her blue bra exposed as she was dragged through the streets of Cairo in December 2011, has become a new symbol of brutality against women. The March 2012 acquittal of a military doctor accused of carrying out virginity tests on female detainees attests to the prevalence of state-sponsored violence towards women. In Tunisia, the rise of the Islamist Ennahda party has come with alarming public displays of intolerance for freedom of speech. In the new draft constitution, a woman is defined as the ''complement with the man in the family''. These pressures will inevitably lead to acts of rebellion. In the Semnan region of Iran a few weeks ago, a cleric was passing two women, and reportedly told one to cover her head better. The woman, punching him to the ground, told him to cover his eyes. Western politicians can apologise for crooked policies and retreat into passivity for fear of committing new errors. Yet none will change the elemental facts. The notion of an Islamic democracy is merely another euphemism for turning women into lesser citizens, and it ought to be deemed as unjust and anti-democratic as America before the end of racial segregation. ''Terrorism'' is only one manifestation of the evil that the world hopes to root out from the region where part-time terrorists have always been full-time chauvinists. The real enemy is misogyny. Malala Yousafzai is not just a teenager in Pakistan's Swat Valley but a victim of the greatest apartheid of our time, and a wounded warrior in feminism's newest front line. Roya Hakakian's most recent book is Assassins of the Turquoise Palace, an account of a 1992 plot to kill Iranian dissidents in Berlin. She left Iran in 1984.
thank you for sharing this .. lately i've been reading about Iran and the rise of Islamists there during the 80's .. it's horrible what happened to that country. I greatly fear a similar fate for Egypt. Christianity and Islam are like cancers - wherever they are, they dig in and spread. I wud like to discuss a few points that u mentioned here and i will start my making a remark, me as a girl noticed, Egyptian guys like 70% cannot have a girl pass by without saying any comment, they HAVE to comment, whatever they say, something must be said. from the age range that has been published by some NGO dealing with this issue which is between 9 and 20 (but not exclusively) we can address those partical ages early in schools and colleges. i wud say starting from the poor schools and neighbourhoods moving to the middle class, but just be4 u say that this wud get islamist started on promoting " girls are the reason" crap, this specific phenom. shud be tackled from a different angel, which "civil rights" and that must be done hand in hand with stronger laws of course. putting this aside, I am with the civil movements that are taking real steps on preventing this phenom. and i wish they can be in the streets encouraging haressed girls to take those animals to the police station and sueing them. yes if enough of those good guys are on the streets and girls feel they have some real support they wud be sued and soon, any guy will think 10 times b4 doing anything like that. but im so mad @ girls, I have witnessed a girl getting robbed, someone tried to grab her bag and run and when some ppl got her bag back, she refused to go to the police station, i can understand why, bec police stations isnt a girl-friendly place and this is why WE NEED TO HAVE A HUMAN ACTIVIST PRESENT IN EVERY POLICE STATION TO MONITOR ANY VIOLATIONS AGAINST WOMEN WHO R REPORTING ANY KIND OF CRIME. That's a good idea, Asmaa. Girls and women should have the right to be treated with respect. And they CERTAINLY shouldn't have to fear the police, whose job it should be to protect them. i totally agree with you that we need a strong civil rights movements taking serious and practical steps towards public awareness of the problem and helping in solving them .. what happened on the streets of down town started with good intentions and ended up with violence and ended up with horrible violations to the civil human rights. We need civil human rights presenters in every police station and every prison to detect and correct any violations that happens in these places .. we need a community that respects the basic rights of every human being regardless of who he is even if he was a criminal brought to the police station to be questioned and investigated with. What i was taking against these patrols is that they have decided to take action and have done many violations where they were blinded by their good intentions. Police stations and not human friendly not to mention being girl friendly :)) .. however i really encourage every girl to take action and report any one who sexually harass her or violates he personal space in any rude inappropriate way. I remember a girl named Noha Roshdy who was the first girl to file a case against her harasser .. she won the case and the guy was imprisoned for three years .. her story was praised by the media and the human rights organizations however only few girls followed her steps. i encourage every girl to be as brave as she was and do the same. @archaeopteryx its still to early for us to be able to speak our minds openely without fear. when u look on how many people are called atheist and against gods' laws like al Baradi and Sabahy and how hell broke loose on anyone who is remotely saying no to anything tha has God's stamp on it, you will get that we cant not exist as we are away from this virtual world or in a country where ur religion doesnt define u in anyway or shape. one more thing we are more than we can ever imagine, can u imagine how many atheist, deist, agnostics ppl are in Egypt? how can we imagine that if the slightest hint on questioning our beliefs bring hell on us!! I do understand, Asmaa, and I just feel so helpless, in that none of us in other countries can do anything about your situation. Even if you united and tried protesting, it would put you in danger.